Salsa Casera or House Salsa is one of the simplest and most flavorful salsas that brings a robust heat and a smokey flavor from the charred tomatoes and chile peppers. Beware! I like heat and so this recipe has one dried Scorpion pepper added to the mix. Scorpion peppers are one of the hottest chiles in the world, with a mean heat of more than 1.2 million Scoville heat units (SHUs). Using a molcajete to grind the ingredients by hand is Mexico’s version of the mortar and pestle. Nearly all salsas were prepared this way before the invention of blenders and food processors. I prefer the texture of the salsa prepared in the molcajete as it remains chunky and you get the full flavor and bits of charred skin from the tomatoes and jalapeños. 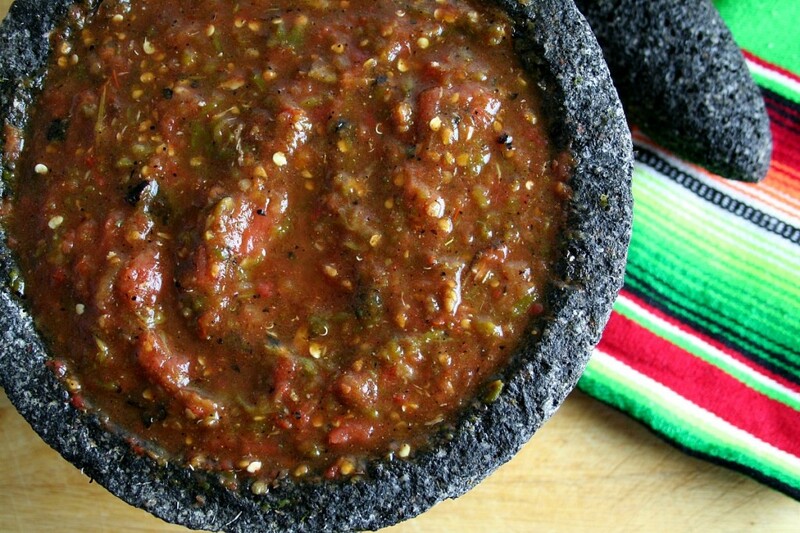 The salsa is a perfect accompaniment with fried tortilla chips, on eggs, or a piece of carne asada steak. I’ll even add a tablespoon or two of it on a tortilla and roll it up like a burrito. It’s that good!! 1. Preheat oven to Broiler. In a large baking sheet, spread out the tomatoes, jalapeno peppers, and garlic. 3. Place the baking sheet under the broiler for 3 minutes until softened and a little charred. 4. Remove and turn over ingredients. Place back in the oven for another 3 minutes. 5. Allow the ingredients to cool. 7. Add the tomatoes and peppers. Continue to mash into a chunky salsa. 8. Move the ingredients to a medium-large bowl. 9. Add the cumin, bouillon, oregano, lime juice, water, and salt. 10. Mix well. Your salsa is ready to serve. A cautionary note about washing your hands in warmer water after handling peppers: I’d err on the side of caution and wash them in cold water (along with any cutting boards used with it) as warm to hot water causes the capsaicin to aerate and boom, instant pepper spray you didn’t intend to make.